As fully Filipino-owned Lamoiyan Corporation, known for producing quality toothpaste brand Hapee, celebrates its 25th anniversary this year, it never failed to bring world-class quality yet affordable products that had earned the people’s trust and loyalty over the past more than 2 decades. But more importantly, it continues to serve as inspiration among other companies in showing genuine love and care for the environment and people, sharing not just more reasons to smile but also in practicing good corporate citizenship. As its contribution in helping preserve precious natural resources, Lamoiyan Corporation fully supports Republic Act 9275 or the “Clean Water Act of the Philippines” by using recycled waste water around its plant. After treatment and disinfection, the waste water is then used to water all flowering plants and fruit-bearing trees around the company’s sprawling compound in Parañaque City, helping the company save precious water and reduce its water consumption expenses. Lamoiyan also continues to protect the welfare of people, particularly school-age kids. Recognizing the fact that lice infestation is a constant concern that affects kids’ performance in school, the company conducts “Licealiz Oplan Laban sa Kuto” each year in various schools and communities and teaches children and adults alike regarding proper hair and scalp care. And during the yearly “Brigada Eskwela” efforts of the Department of Education, Lamoiyan Corporation also helps out by donating Hapee toothpaste and Licealiz packs to students to help educate them about the value of dental and hair and scalp care so they won’t be absent from school often because of dental and hair care problems. Dental missions, in partnership with government agencies and concerned organizations and associations such as “Operation Smile,” an international group that performs corrective surgery on children with cleft palate, and the Philippine Dental Association (PDA), are also common activities for Lamoiyan Corporation executives and employees. With “Operation Smile,” the company helped put up the country’s first Cleft Palate Care Center in Manila, and also works hand-in-hand with its trade partners and distributors around the country and PDA dental care professionals in holding dental missions in marginalized communities around the country to help teach them about proper oral and dental care. These activities help support Lamoiyan Corporation’s belief that a nation with healthy teeth leads to a healthy and productive life. And just recently, as part of its 25th anniversary, Lamoiyan Corporation partnered with hybrid-rice seed producer SL Agritech Corporation in order to teach deaf and mute students of the Deaf Evangelistic Alliance Foundation (DEAF, Inc.), a foundation chaired by no less than Lamoiyan Corporation President Dr. Cecilio K. Pedro himself, to plant hybrid rice in Cavinti, Laguna. 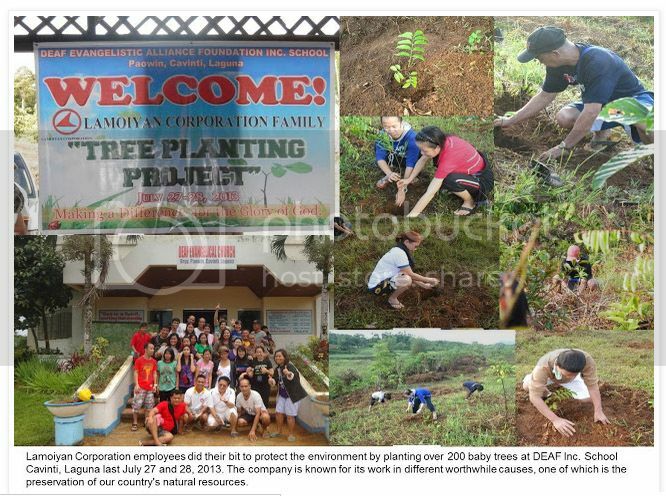 The deaf and mute and DEAF, Inc. are close to Dr. Pedro’s heart, which is why Lamoiyan Corporation continues to provide gainful employment to physically handicapped members of society like them. For this purpose, Lamoiyan and SL Agritech signed a Memorandum of Agreement (MOA) where DEAF, Inc.’s members can cultivate hybrid rice in a 1-hectare plot located within the property of this well- known organization. Under the MOA, SL Agritech, a subsidiary of Sterling Paper Group of Companies which started performing research work on hybrid rice in 1998, will provide 5 kilos each of four varieties of high-yielding hybrid-rice seeds such as SL-8H, SL-9H, SL-11H and SL-18H. Aside from seedling provision, SL Agritech, which started selling five variants of rice under the Doňa Maria brand such as Jasponica, Jasponica Brown, Miponica, Miponica Brown and Jasponica Plus in 2004, will also provide technical assistance to ensure that the recommended planting protocol will be strictly followed in order to assure high yield for the planted seedlings. After this cropping season, Dr. Pedro even announced that the 1-hectare plot could be expanded to 2 hectares in the future. “Over the years, Lamoiyan Corporation stood by its commitment to care for our environment and our people. We have a taken the responsibility to contribute in our own small way in protecting Mother Nature and our countrymen who need genuine care, like our deaf and mute community. That commitment will continue as long as it takes, so that many can continue to smile at life, and look forward to a better future,” Dr. Pedro said.